The Private Life of Sherlock Holmes was directed by Billy Wilder in 1970, and came relatively late in the career of Miklos Rozsa when the film composer was already in his 60s. The composer already had a substantial body of not only film scores but also concert music behind him, and it was an example of the latter that served as the basis for this score. Rozsa had composed his Concerto for Violin and Orchestra for Jascha Heifetz back in 1956 and this was a favourite pieces of the director's. Wilder used to relax to this music while working on his films and had promised the composer that one day he would incorporate the music into one of his films. 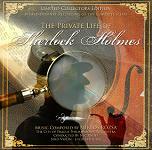 "The Private Life of Sherlock Holmes" was to be the film which kept that promise, and so it was that Wilder asked Rozsa to adapt his music and create new thematic material to be included in this film score. This was a fitting choice as Arthur Conan Doyle's fictional detective played the instrument himself. The result is the best ever musical interpretation of the great detective, and we have included some sound samples below in our description of this superb soundtrack release. The album kicks of with the "Main Titles" which very much has a traditional overture structure introducing some of the main themes. After a brief fanfare opening, it launches into the Main Theme which seems to capture perfectly the outward character of this great detective and the times in which he lived. A secondary adventure theme takes over for a while and then leads into the Love Theme with its sumptuous solo violin, before returning to the main detective theme in the "221B Baker Street" section. The "Smoke Machine / Concerto / Cocaine" track is darker and more mysterious though flowing into a middle section of unaccompanied violin solo for "Concerto". The next track is a good workout for the whole orchestra written for scenes removed in the final cut of the film, and "Moving Out" continues the violin concerto in a sequence also cut from the movie. "Watson's Rage" is moody and more reflective in nature and then "Von Tirpitz" introduces another important theme which we've here labelled the Monastic Theme. The "Gabrielle" track is the heart of the whole soundtrack, a slow movement based on the violin concerto's love theme but clearly slightly troubled. This describes Holmes infatuation for a mysterious lady and must surely represent an important aspect of his "Private Life". The adventure continues over a series of tracks which takes us to a number of London-based locations including "The Diogenes Club" with its Elgarian Pomp & Circumstance Theme before heading off to Scotland. In "To Glenahurich" Rozsa treats us to an arrangement of the well-known melody for the Scottish song "Loch Lomond". Other tracks make reference to other Scottish folk material and carry the adventure to other Scottish locations, through a number of action oriented scenes like the rhythmic train ride of "Castles of Scotland", and even an encounter with the Loch Ness Monster, before thematically tying up a number of lose ends and final mysteries in the story. In the final "Auf Wiedersehen / The End" track the violin leads us one last time through the key themes in a grand symphonic coda, but the album doesn't end there. A total of four bonus tracks illustrate the evolution of the finished music with alternative versions which were recorded but ultimately not used in the final film. The comprehensive sleeves notes tell us how this re-recording came about as a filler recording session because the City of Prague Philharmonic Orchestra had originally been booked for another project which had fallen through. However in one of those rare fortuitous sequence of events, they managed to secure not just the music from the film itself but also a number of cues written for the film but not used in the final cut, and all this in the centenary year of the composer's birth. The CD has a total running time of 78 minutes including 20 minutes not used in the film. This album, a Limited Collector's Edition, can be found at Amazon.co.uk and Amazon.com, and there is more information about Tadlow soundtrack releases at www.tadlowmusic.com. One of those definitive soundtracks that you'll want to listen to again and again.